Children and youth need a safe, fun place to feel at home, and The Salvation Army Portland Tabernacle Corps provides this and much more. Scouting programs, music lessons, junior band, day camp, overnight camp, dance and excursions. The Portland Tabernacle Corps is a home away from home for youth looking for a place to belong. Here at The Salvation Army Portland Tabernacle Corps, we are always interested in providing the best level of service by creating an atmosphere of love and care. Moonbeams are members of a national character-building program sponsored by The Salvation Army for boys and girls in grades Preschool through Kindergarten. They'll meet friends and have fun learning about Jesus as they earn a variety of emblems such as Colors, Manners, Space and many more. 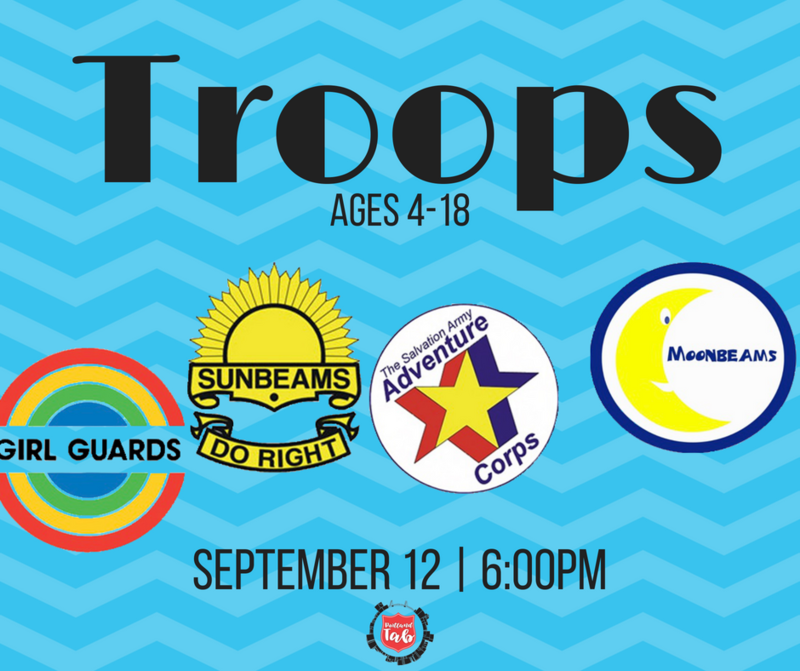 Sunbeams is a character building program sponsored by The Salvation Army. Sunbeams is open to girls who are in the 1st through 5th grade of school. The Sunbeam program focuses on helping girls learn about themselves and their world. They do this through programs centered around education, fellowship, service and worship. These girls earn a variety of emblems that they wear on a sash. Girl Guards is for girls who are in the 6th through 12th grade of school. The Guarding program opens the door to many exciting and new experiences. With each experience they are encouraged to discover things about themselves and the world God has created. Girls Guards meet together as a troop to earn a variety of emblems that they wear on a sash, such as: learning new skills, hiking, singing, camping, swimming, making handicrafts, meeting new friends, going on trips, and serving the people in the community. Gaining a sense of personal identity and character through interaction with other boys and leaders. Learning the importance of Christian values and biblical truths by experiencing God's Word and by the modeled example of their Christian leaders. Developing physical, mental, and social skills as challenged by the Adventure Corps program. Providing a balanced environment for learning, developing and caring that is child oriented and Christ centered. Junior Young People's League (YPL) is a youth group for middle school students (grades 6-8) designed to allow young people an opportunity to come together and fellowship in a safe environment. During Jr. YPL we allow for free time when children can play basketball, volley ball, board games, or just sit around and chat. After free time we have a planned activity and a short devotional. On occasion we also have planned outings. Jr. YPL meets on the 1st and 3rd Friday of every month, unless otherwise scheduled. Senior Young People's Leage (YPL) is a group for teens in high school (grades 9-12) designed to give young people an opportunity to come together and fellowship in a safe environment. During Sr. YPL we allow for free time when teens can play basketball, volley ball, board games, or just sit around and chat. After free time we have a planned activity and a short devotional. On occasion we also have planned outings. Sr. YPL meets on the 2nd and 4th Friday of every month, unless otherwise scheduled. The Corps Cadet program is one of the most vital programs in The Salvation Army because its goal is the preparation of spiritually mature, committed, servant-leaders. Members are literally cadets in the corps, learning to become the leaders of tomorrow. Corps Cadet membership is for young people at least 12 years old and in the 6th grade, actively part of the weekly Corps programs, and enrolled as a Junior or Senior Soldier. Youth Councils is an annual event that gives an opportunity for young people ages 13 through 22 from Oregon and Southern Idaho, to spend a weekend at Camp Kuratli. During the course of the three day conference delegates attend keynote sessions and special breakout sessions that cover a wide variety of relevant topics, and enjoy a time of fun and fellowship. The ultimate goal of Youth Councils is to bring delegates into a closer relationship with Jesus Christ. Vacation Bible School (VBS) is a week long, fun-filled program we offer during spring break to connect with the children and families within our community. Vacation Bible School is for children 7 through 12 years old. During these 5 days the children rotate between crafts, bible lesson, games, and sing songs all while learning important lessons for life. VBS is a fun time where kids are able to be kids while learning more about God. 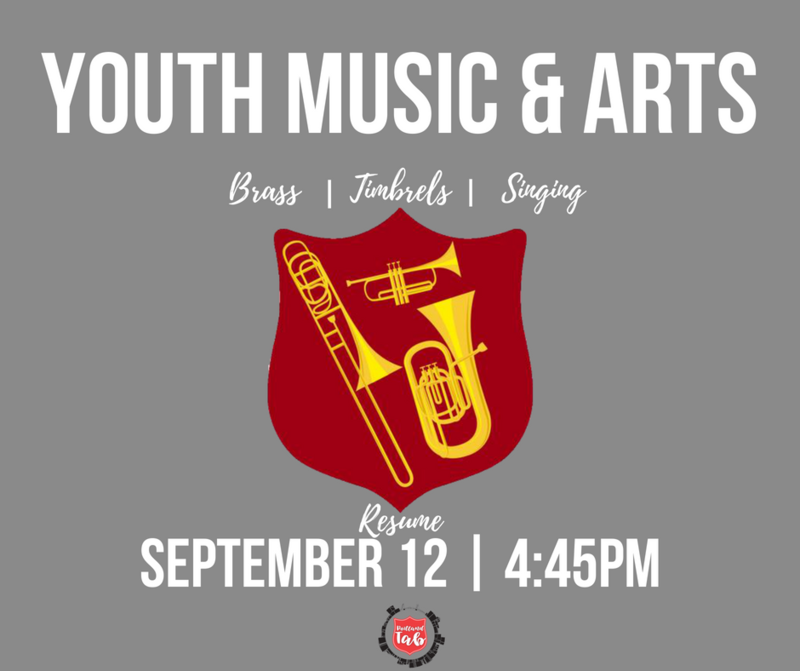 Beginner & Junior Band - A band made up of brass instruments for children ages 6 to 18. This band is for children who are at beginner and intermediate level and prepares them to play at a higher level and also gives them the chance to play with other young musicians. Singing Company - Singing Company is a junior chorus of the church for boys and girls 5-13 years of age. They sing in Sunday services on a regular basis and at special events at the Portland Tabernacle Corps. From 9:45 -10:30 we have age specific class for all ages before our main worship service.